A really great winter coat is hard to come by and therefore deserves a great coat-centric outfit to let it shine. So once you've got over the first hurdle of finally deciding which coat trend to opt in on (or to ignore all trends and land on a classic such as a camel number), it's then a case of styling it up to perfection. More often than not, the obvious choice when outfit-building around outerwear is to slip said coat over a chunky knit and jeans, but after only a few short weeks, that fail-safe formula can feel a little tired. This is where we come in. We're all too familiar with the challenges that come with the cold weather dressing, so we've rounded-up 20 easy-to-copy coats outfit ideas to ensure you have all the sartorial inspiration you need, from now and way into the depths of winter. From vinyl trenches to checked maxi coats, scroll below to see how our favourite influencers are going to style their coat outfits up this year. 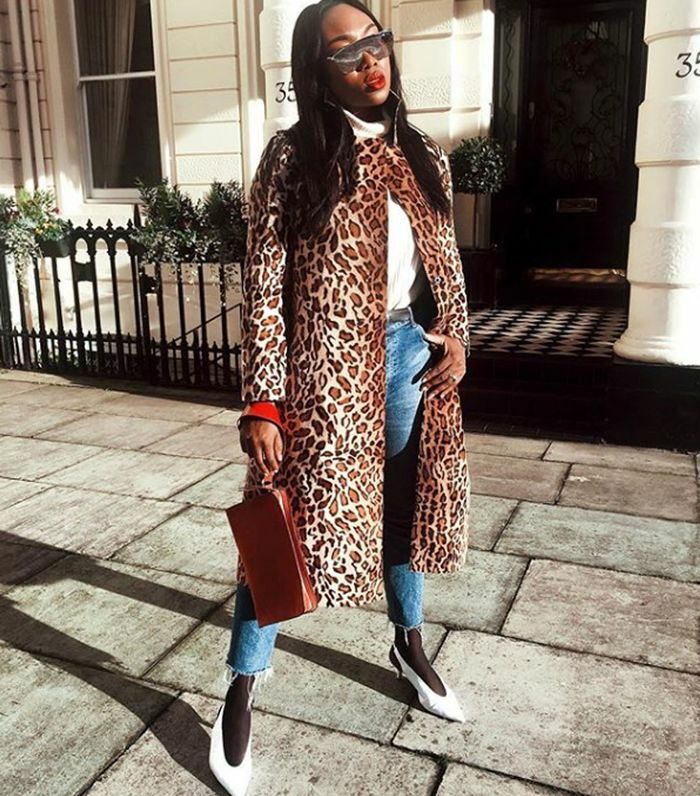 In our opinion, no wardrobe is complete without one, and Nnenna Echem's collarless iteration, styled with white slingback heels and standout sunnies, prove the leopard-print coat is firmly back on the map. 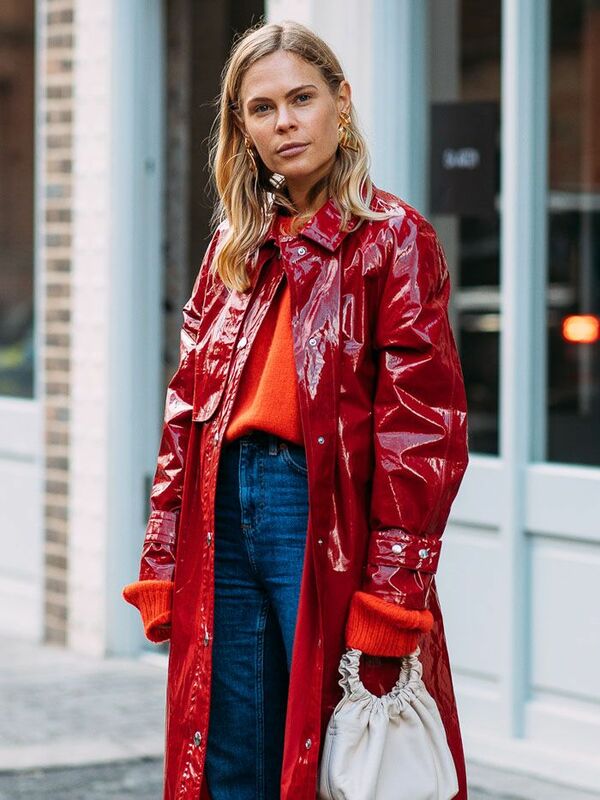 Anna Vitiello is the queen of accessories, so it's no surprise that she's managed to make the standout vinyl trench feel even cooler, teaming hers with white boots and a Tara Zadeh bag. How to make a classic checked iteration feel new? Take your cue from Blanca and add one or two directional accessories—and maybe even another plaid in the mix. Camille Charriere knows all too well that a silky skirt and a pair of over-the-knee boots make a trench coat feel infinitely cooler. Think your basket bag is just for summer? Think again. Stephanie proves the woven accessory looks just as good worn with sombre outerwear. Jessie Bush takes a retro route with her belted coat worn with tan suede accessories and a matchy bag. If you're into colour, try a high-shine trench and style it just like Doina, with a white roll-neck, jeans and red boots. Erica Davies is the master of colour-clashing, seen here confirming green, lilac and marigold work perfectly together. Looking for outfit inspo during the tricky transitional weather? Go for something snake print, and team your mac with a yellow miniskirt and white boots. Bravo, Hanna Stefansson. Bored with dark and depressing coats? Look to Gxiayan layering up icy blues, whites and greys with this charming ensemble. Looking for an evening coat? Why not take your cue from Leandra Medine and slip an oversized mac over your printed frock? Nothing beats a mac, and just when you thought you'd exhausted every outfit, Linda Tol inspired us to wear one over a checked midi skirt with Converse. If in doubt, belt up. Lindsey Holland pairs her red iteration with ankle-grazing jeans, fuss-free hair and boots. Not a fan of sensible silhouettes? Neither is Lisa Aiken, seen here in a supersized trench–and–checked scarf combo. Sometimes when it's really cold, the simplest options can be the chicest. Lucy Williams confirms our theory, stepping out in a pair of distressed jeans, chunky boots and a maxi coat. Or when there's only a light chill, Monikh's easy-to-re-create trench, tee and trainers look is just about right. Checks needn't be neutral. One look at Pernille Teisbaek's yellow look has us searching for rainbow checks and matching heels. Or why not wear your masculine tailored coat with sleek separates like the queen of minimalism, Roberta Benteler? Not convinced about the puffer-and–midi dress combo? Let Ellie of Slip Into Style convince you to try the trend. Don't forget your ankle boots!